(A little disclaimer – we are not certified organic and don’t claim to be. That’s because although we are committed to organics and buy organic when possible, our priorities are as follows: 1 = taste, 2 = fresh, 3 = local, 4 = organic. In other words, we’d rather use delicious, fresh milk from a local farm than organic milk powder brought in from another country. We can then also push for our local partners to move organic. 1. Melt the chocolate in a double boiler. 2. Sift cocoa and sugar together in a heat-proof bowl. 3. Stir in water in small parts until the sugar and cocoa are completely dissolved. 4. Add the water/cocoa/sugar mix to the melted chocolate in small parts, stirring until you have a smooth emulsion. 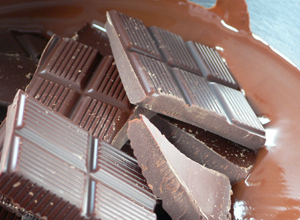 The chocolate will clump at first, but just keep adding the liquid and stirring until it is smooth and glossy. 5. Cool the mix completely. 6. Freeze using a domestic ice cream maker or cover and place in the freezer, stirring every two hours to break up the ice crystals. 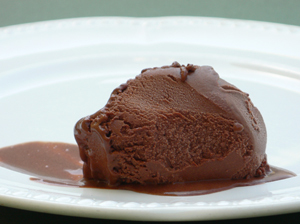 Your Chocolate Sorbet looks just too good! Worth a trip to Kerry! However, and despite your disclaimer, you cannot legally use the word Organic in the name of the product unless you are certfied. I presume, but can’t confirm, that you can indicate that the ingredients are organic sugar, organic chocolate etc., but you can not call it Organic Chocolate Sorbet. I won’t give you a dissertation as to why you can’t use the word Organic! We would never use “organic” on our packaging, but since this sorbet has all organic ingredients and the recipe is intended for home use, I think that the recipe can be called “Organic Chocolate Sorbet…” Or? Hi Kieran, thanks for this recipe. I tried it a few days ago. It mixed together beatifully and smoothly. I wonder if I did something wrong, though, because it wouldn’t freeze in my ice-cream maker. I ended up putting it straight into the freezer… but I was delighted with the result anyway! So incredibly rich. You’re right about that chocolate kick. Ah, no, it was just at room temperature when I put it in the machine. Now I have an excuse to make it again, thanks!! Yummers, thanks for the recipe! 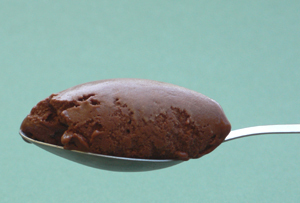 I was looking for a low-fat chocolate sorbet (with cocoa powder mostly), but this looks delicious, and I’ll try it. 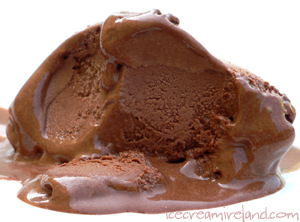 I tried this chocolate sorbet recipe this weekend and I loved it! It is so rich and smooth,everyone was surprised there was no cream or milk… The only thing is it melts very very fast once you take it out to serve it, but it is probably due to thr consistency 🙂 anyway, thanks for the recipe, will do it again!